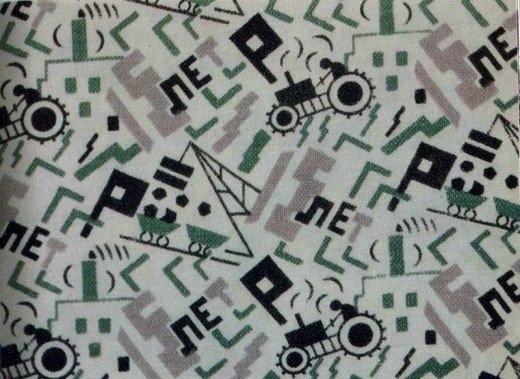 Some of these fabrics really counter the usual view of the Soviet Union as the ultimate in drabness, but I wonder how much of this type of stuff actually got made. There were lots of brilliant design ideas around in the 1920s in particular, aimed at transforming everyday life, but an awful lot of them, it seems, never got further than the drawing board. But I think these are fabulous nevertheless. 3. I have far fewer nostalgic feelings about Soviet cigarettes (again from English Russia), doubtless because I have smoked far too many of them in my time. But you can’t deny the quality of some of the package designs. That alone should tell you something about the relative importance of eating and smoking in Soviet culture, but if you’re still unconvinced, this article from Russian Life gives plentiful background on the Russian smoking epidemic. Dieselpunks also has some good Soviet cigarette posters. 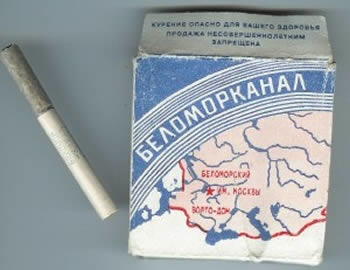 First produced to celebrate the opening of the White Sea Canal – built by slave labourers provided by the Gulag – and containing without doubt the most vile cigarettes known to mankind (‘5th class’ tobacco, the packets proudly proclaim), with a cardboard tube that seems to have the opposite effect of a filter, smoking these things is an experience I would not recommend to anyone. There was always that depressing point in the night when everybody had run out of decent cigarettes and there was only a packet of Belomorkanal left, and you knew very well that eventually you’d end up having one, and you knew beforehand how much you’d regret it… Possibly the best thing about giving up smoking is knowing that I will never taste Belomorkanal again. But the longevity of the brand is quite remarkable, and I can’t help admiring those babushki who still puff away on them, if not with a look of enjoyment, then at least without the appearance that they’re overdosing on toxic chemicals. Thanks for the info on soviet fabrics (and the cigarettes too). I am researching for a collection of fabric designs based on soviet designs for the central asian textile market. This is just the link I needed! It’s a pleasure – I’d be very interested to see these when they’re done.